It’s Halloween, and parents should know about food safety tips to protect their children. These are offered by Jacquelyn Arnold with the Shelby County Health Department in Alabama. Make sure that your kids have eaten a snack or light meal before they go out trick-or-treating. They shouldn’t snack while they are out, because you need to inspect the treats they are given before they eat them. Tell your children not to accept – and especially, not to eat – anything that isn’t commercially wrapped. The kids should wait until they get home and you have checked the candy before they take a bite. Always discard any homemade treats unless you are absolutely sure they are from someone you know and trust. Inspect the commercially wrapped treats for any signs of tampering. They may include discoloration, an unusual appearance, tiny pinholes, or tears in the wrappers. Throw away anything that looks suspicious. And discard any treats with open or torn wrapping. Consider given alternative treats for health reasons. You may give out packages or crackers with cheese or peanut butter, fruit leather, mini boxes of raisins, hot chocolate mix packages, or microwaveable popcorn. The kids may not be happy, though! 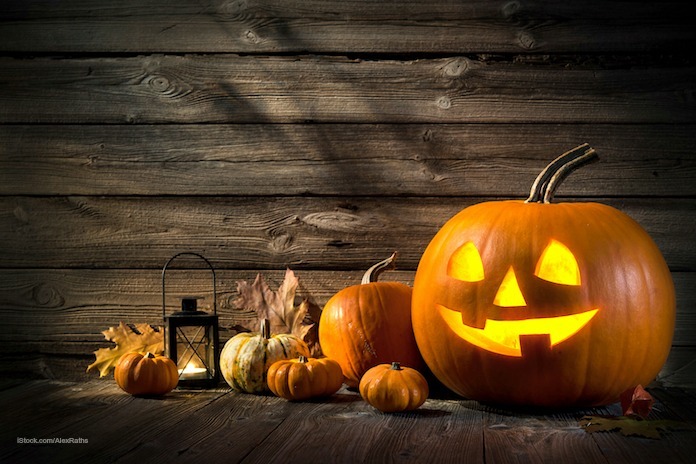 If you are having a Halloween party, there are food safety issues to consider too. If you are having caterers make the food for your party, work with a reputable, licensed facility. Have properly working chafing dishes to keep hot food hot, and chilled serving dishes or ice to keep cold foods cold. Remember that the danger zone for bacterial growth is between 40°F and 140°F. Make sure that there is plenty of room in your fridge to store cold food before, during, and after the party. If the fridge is too crowded, store and cool drinks in coolers with plenty of ice. Wash fresh vegetables and fruit before serving. If you are serving juice or cider at your party, make sure it is pasteurized to kill pathogenic bacteria. Products that have not been treated and are therefore raw will say so on the label. Have a happy Halloween! And stay safe.